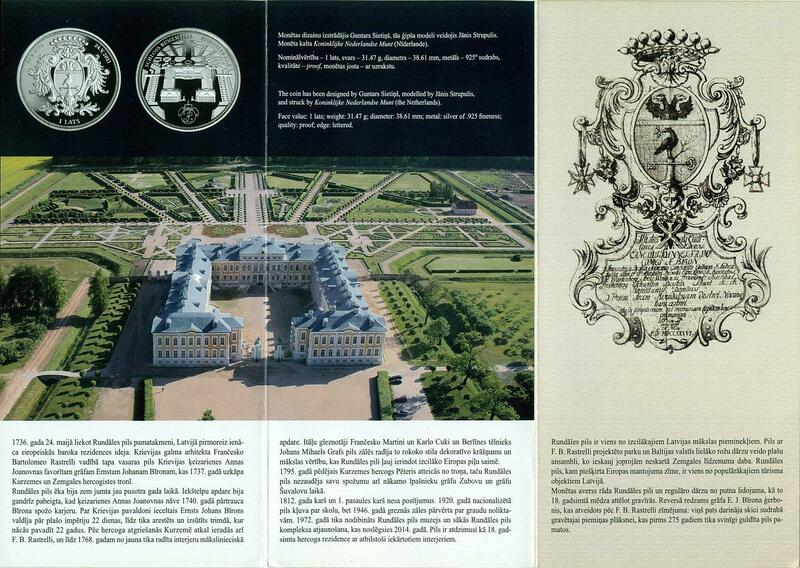 With the cornerstone of Rundāle Palace laid on 24 May 1736, the idea of European baroque residence arrived in Latvia. Under the Russian court architect Francesco Bartolomeo Rastrelli, a summer palace was built for Count Ernst Johann Biron – the favourite of the Russian Empress Anna Ioanovna – who acceded to the throne of the Duchy of Courland and Semigallia in 1737. The building was under the cover of a roof within a year and a half. The interior was almost finished when the death of Empress Anna Ioanovna in 1740 put an end to Biron's brilliant career. Ernst Johann Biron became regent of Russia and ruled the vast empire for a total of twenty-two days, after which he was arrested and exiled for twenty-two years. When the Duke returned to Courland, he was soon joined by F. B. Rastrelli, and by 1768 a new interior was complete. Italian painters Francesco Martini and Carlo Zucci as well as the Berlin sculptor Johann Michael Graff created the ornate rococo interior of great artistic value that ranks the Rundāle Palace among the most outstanding European palaces. In 1795, Peter, the last Duke of Courland, abdicated, yet the Rundāle Palace lost none of its glamour as it passed on to the Counts Zubov and Shuvalov. The war of 1812 and the Great War brought considerable damage to the palace. In 1920, the nationalised palace was turned into a school, but in 1946, the ornate halls were transformed into grain stores. In 1972 when the Rundāle Palace Museum was established, renovation of the palace was launched; it is expected to be completed in 2014. The palace has been reborn as an 18th century residence of the Duke with corresponding interiors. The Rundāle Palace is an outstanding monument of Latvian art. The palace along with the park designed by F. B. Rastrelli and the largest rose garden of the Baltic States form a sizeable ensemble surrounded by undisturbed nature of the Zemgale Plain. A European Heritage Site, the Rundāle Palace is a very popular tourism destination in Latvia. 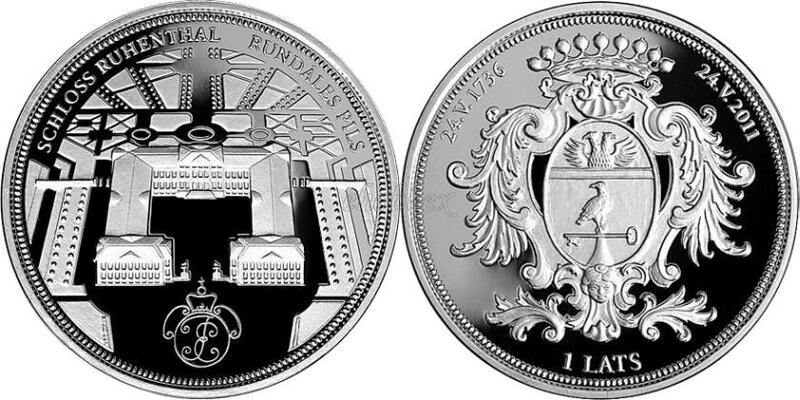 The obverse of the coin features a bird's eye view of Rundāle Palace and its formal gardens as they used to be represented in the 18th century engravings. The coat of arms of Count E. J. Biron, designed after a drawing by F. B. Rastrelli (he made a sketch for the engraved silver memorial plaque that was laid at the foundation of the palace 275 years ago) is on the reverse. The coat of arms of Earl Ernst Johann von Biron taken from the design (drawing by Francesco Bartolomeo Rastrelli (1700–1771), architect of Rundāle Palace) of the memorial plaque of the Rundāle Palace foundation stone is placed in the centre. The inscriptions of the dates 24.V.1736 and 24.V.2011 are semicircled at the top on either side of the coat of arms. The inscription1 LATS, also arranged in a semicircle, is beneath the coat of arms. 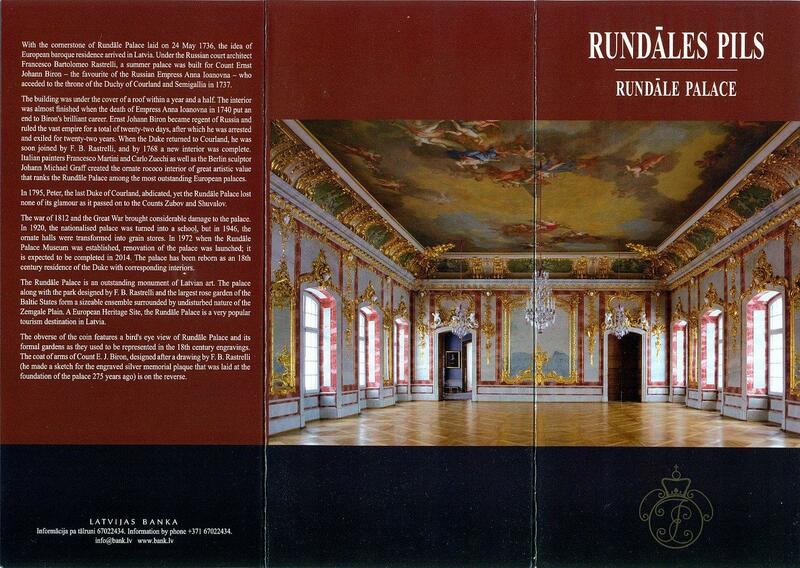 The reverse features bird's eye images of the Palace and the adjacent regular park, with semicircled inscriptions SCHLOSS RUHENTHAL on the left and RUNDĀLES PILS on the right at the top. There is the monogram of Ernst Johann, Duke of Courland, beneath the images.